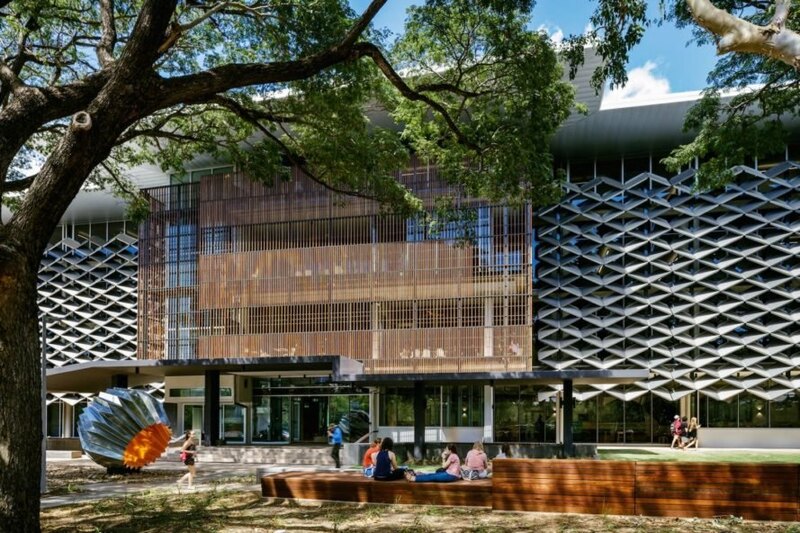 The Science Place at James Cook University recently became Australia’s first educational building to achieve a prestigious LEED Gold rating. Designed by HASSELL, the sustainable building with state-of-the-art facilities brings together the university’s chemistry, biochemistry and biology research cohorts under one roof. The Science Place also recovered and recycled 96% of all the previous building materials—a new record for a Townsville development of its size. The nearly 130,000-square-foot The Science Place building serves as the iconic “home of science” and central hub on the university campus. The four-story structure stacks two floors of dedicated scientific research areas atop research-led learning spaces on the lower two floors, all linked by light-filled atrium spaces and a central open stair. “We’ve seen a surge in the desire to house STEM activities under the one roof as a way to increase cross-disciplinary education and knowledge sharing, and The Science Place is a prime example of achieving this goal,” said HASSELL Principal Mark Roehrs. “This not only makes sense from a building and asset point of view, but also for student experience as it increases interaction.” In addition to the recovery and recycling of previous building materials, the LEED Gold-certified university building keeps power consumption to a minimum thanks to natural daylight, daylight-sensitive lighting, water-saving taps, and a light-colored reflective roof that reduces solar heat gain. A 25kW solar rooftop area also generates 125kWh of renewable energy a day. For improved health and comfort, the building is also equipped with superior indoor air quality management and testing, multiple low-emitting materials, and performance-optimized smart metering.